A very short post because I've been extremely busy getting everything ready for school today! I'm going to give you a few quick tips for how to make sure you're prepared for the first day of college. You need to eat to survive! If you live in the dorms, don't forget to buy your meal plan and some snacks to keep in your room for when you get hungry. If you live in a place that has a kitchen, go grocery shopping! It's funny how you can forget such a simple thing, but with all the crazy-ness going on with moving in, anything can slip past you. If you drive to school, make sure your car has gas! I always fill up my tank the day before school, it just gives you one less thing to stress out about. I honestly asked my roommates "What do we pack for school again?" because my mind is focusing on so many things that it's a little difficult for me to think straight. Some of the most important things I keep in my bag are my wallet (which has my school ID! ), notebooks, pens/pencils, keys, a snack, and a water bottle. Know your schedule thoroughly. I have a lot of back to back classes on Mondays and need to know when I'll have time for meals (turns out I don't!) and how long it will take to get to each class. Figure out the location of your class, and where your next class is to make sure you can get to the rooms without hassle. Chapman is a small campus, so I don't exactly have this issue, but I know with bigger schools it can be tough to walk across campus in 15 minutes or less. Also, bring snacks if you know you won't have time to get meals in between class. I know that parties are probably happening, and as a freshman, you're really excited to go to every single one that you hear about, even if that means going to one before the first day. Trust me, there will be other parties, there will be other nights to gossip with your roommates, etc. Go to bed at a reasonable hour, and make sure you set an alarm or two. If you haven't been on a good sleep schedule all summer, now's the perfect time to start one! Sorry this post was super short, guys! I promise that after I'm all set up (that means by Wednesday!) it will be back to my normal posts! Hope you all have a great start to your semester! If you're like me, you spend more time scrolling through the endless options on Netflix than you do actually watching something. I decided to do some of the work for you, so that the next time you sit down to watch some new tv shows, check out this mini guide! I'm horrible at these show summaries, so I suggest you just watch the shows on this list instead of reading them haha! In my opinion, this is the best category on Netflix in terms of variety. So many shows that I love are in this category, so I'm a little biased. Spotted: A group of elite upper east siders with dramatic lives full or romance, affairs, money problems, and alcohol abuse, all narrated by an anonymous blogger who seems to know everyone's secrets. It's such a guilty pleasure show, and even though these characters are a tad bit unrealistic, it's so fun to watch all the drama unfold. Easy to binge watch for hours on end, and will keep you guessing at what's going to happen on the show next. Poor Elena Gilbert is horrible at making decisions, and always wants to save people, but never herself. 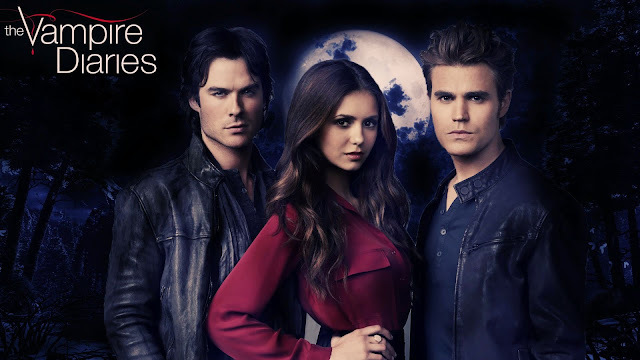 Everyone loves Elena, and that seems to be a problem when brothers Stephan and Damon Salvatore, both vampires, try to win her affection. This show arguably has the most lovable villain in later seasons, and always has some new bad guy coming out of the shadows. Always so dramatic, but so incredibly addictive. A group of (SURPRISE!) dramatic teenagers. 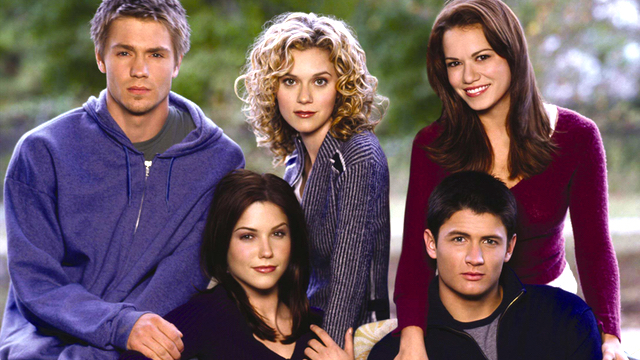 Living in the small town Tree Hill, where basketball is life, and there are so many romances and love triangles it's hard to keep count. I'm only on season 3 of this show, but I already know it's more dramatic than the Gossip Girl and The Vampire Diaries, and deals with more normal life situation. I have a lot of emotions for this show. I had heard about how great this show was for years, but didn't want to watch it for some reason, what a poor decision on my part! 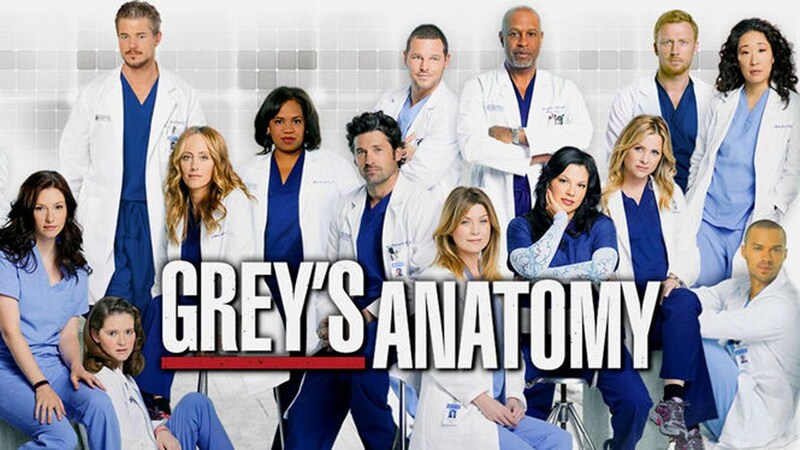 The show follows intern, and future resident Meredith Grey as she and her coworkers go through the daily life of a surgeon. Personal and professional drama follows everyone, and a piece of advice, don't get attached to the characters. I've talked about my love for this show before, but it's just so hilarious! 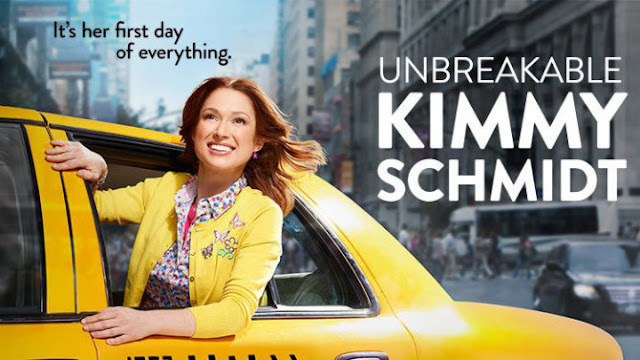 Kimmy Schmidt was a Mole Woman, as in, she was kidnapped from a young age and was told the apocalypse had killed everyone but the cult that she was put into. After many years underground, the women are rescued, and Kimmy decides that she wants to start her life in New York City. The downside? She has no idea how the world works anymore. 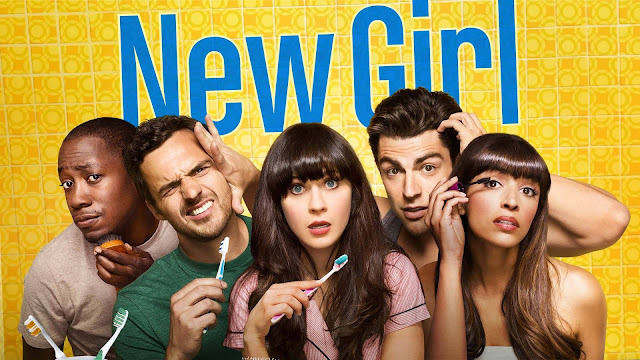 Well-known quirky girl Zoe Deschanel moves in with a group of strange, but lovable guys. I've only watched the first season, but trust me on this one! One of the funniest, and weirdest shows I've ever watched. 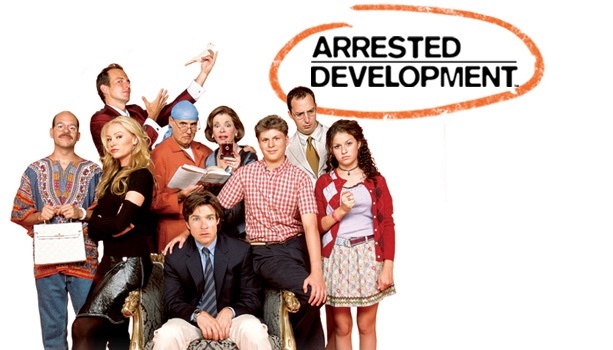 George Bluth Sr. has been arrested for a white collar crime, and his son Michael is forced to run the family real estate business with his eccentric family by his side, including his awkward and charming son George Michael. Living in one of their housing developments, the once rich family struggles with their new lifestyle while trying to support one another. Is it just me, or do crime dramas always seem to save the day when you have absolutely no clue what to watch? They're great because, for a lot of them, you don't need to follow each episode to understand what's going on, so you can pick up anywhere! 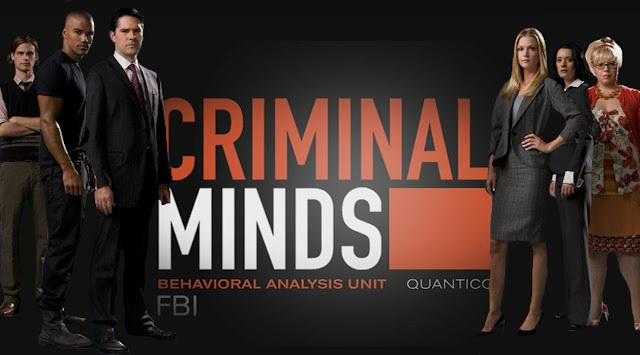 The FBI's Behavioral Analysis Unit (BAU) profiles criminals across the country and travels to help solve the crimes. Focusing mostly on serial killers, the whole team is smart, cunning, and comical at times. I grew up watching this show (thinking back, maybe this wasn't a great thing to watch when I was younger...) and it's always been one of my favorites. The characters are lovable, and you really can't help falling in love with them. I never thought that I would be rooting for a serial killer not to get caught. 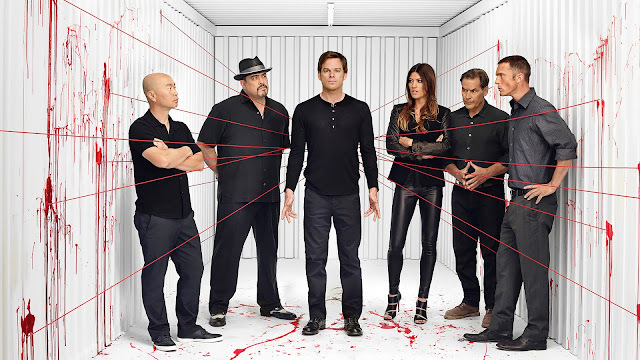 Dexter Morgan appears to be a normal guy during the day at his job as the blood spatter analyst, but when he isn't working, he's a vigilante/psychopath hunting out and taking out criminals. Can he keep his secret? Note: Lots of blood! I've never met a person who doesn't like SVU. 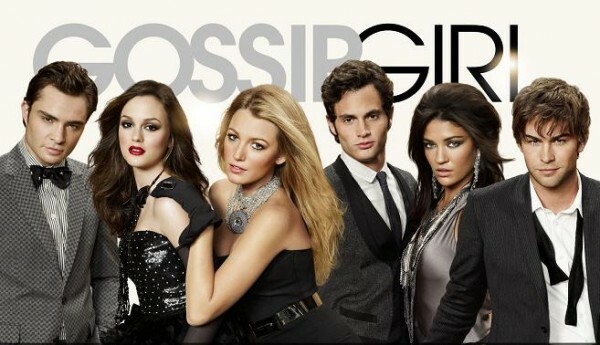 It's just one of those shows that you can't stop watching, and if you see a marathon on TV you can't say no. I'm doing a disservice by using this picture because it doesn't have Detective Stabler in it, and we all know he was one of the best characters. 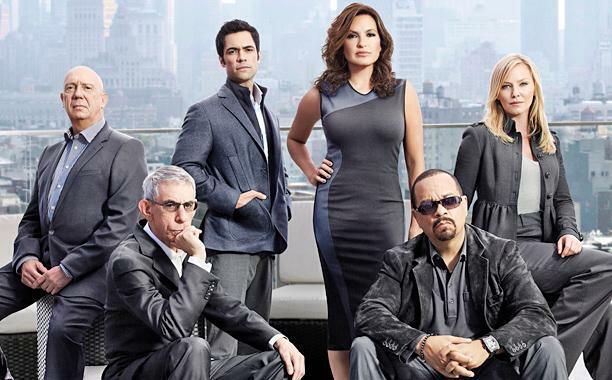 If you don't know what Law and Order is about, you've been living under a rock. 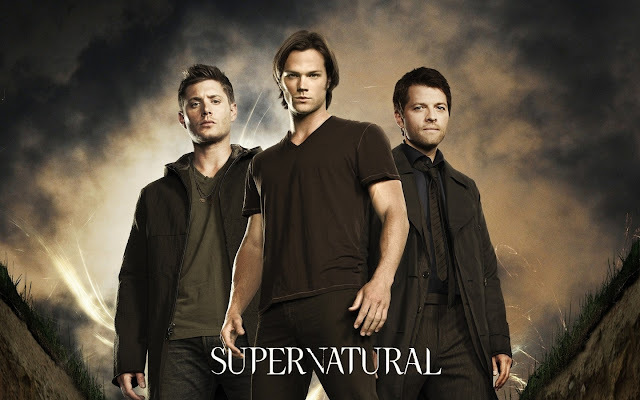 Brothers Sam and Dean Winchester hunt supernatural creatures of all sorts, and run into trouble in nearly every episode. Despite being somewhat of a drama, it's actually pretty hilarious most of the time. It's one of my absolute favorite shows, and I can't recommend it enough! Word to the wise, the first few episodes are the creepiest ones, but get through those and it gets better! The world is full of zombies, and there aren't many people left. You would think that all living people would ban together to try and survive, but that doesn't always work out so well. 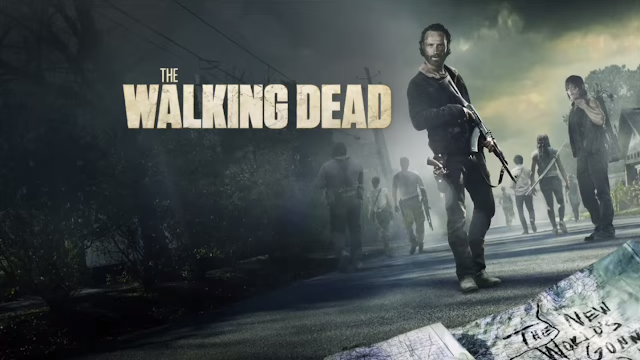 Again, if you haven't heard anything about The Walking Dead, you must be living under a rock since it's one of the most popular shows out there! Hopefully you'll find this little shortcut helpful when deciding what to watch next! Do you have a favorite show that I didn't mention? 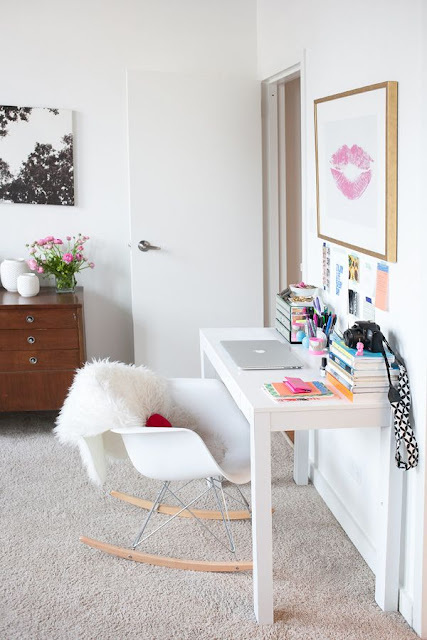 I'm going to tell you something that's a little strange for a blogger...I don't have a desk in my room. Well, at least not at home. At school, it's one of my favorite places to plan out my week and write up blog posts, and while in the dorm, I wasn't too excited with the old, stained desks that we were given. 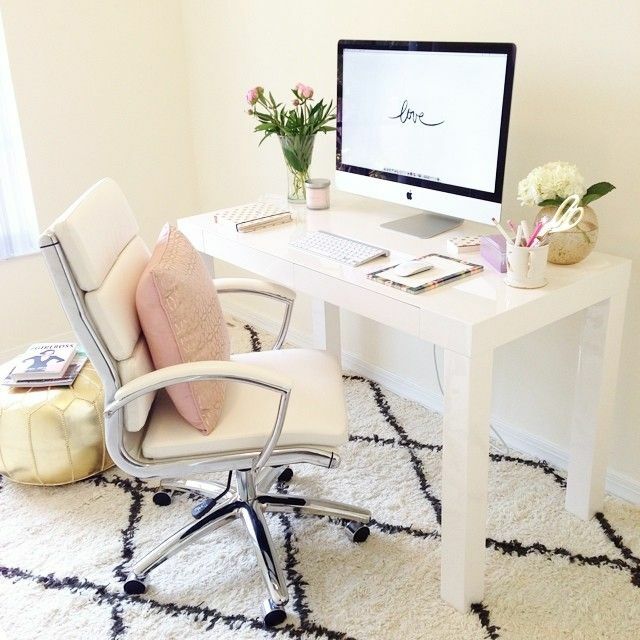 I recently got a white desk from Target, and can't wait to set it up exactly how I want it! Since I'm still in northern California, I can't take any pictures of the current desk situation, but I promise there will eventually be a before and after living space post that will be up when I'm finally done decorating in the condo that will definitely include my desk. 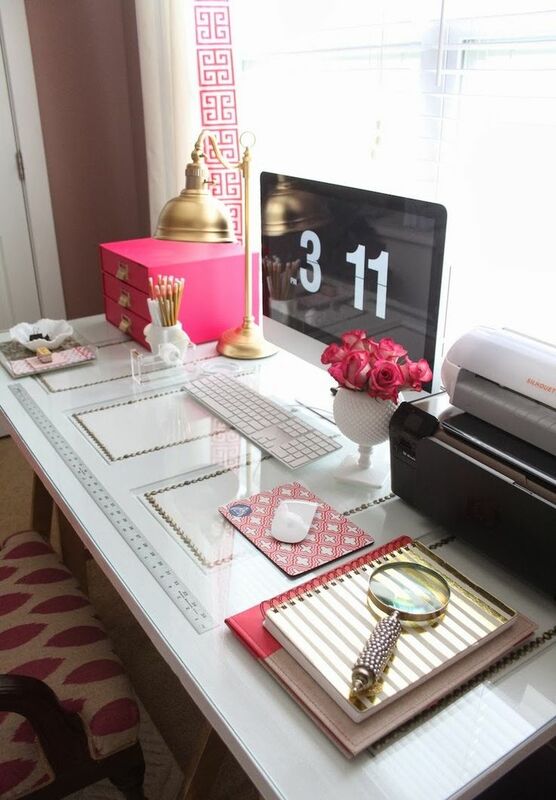 I went to Pinterest and found some great desk set ups that I'll be taking inspiration from! 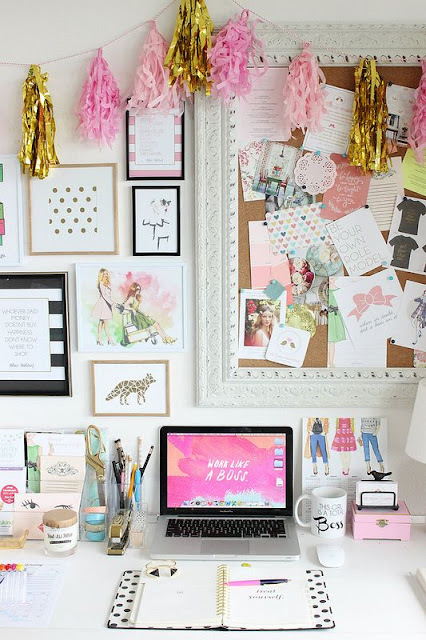 I'll be making an inspiration board for over my desk and I got a head start taking advice from my friend Cristina (check out her blog Cristina On Campus!) to look at this month's Glamour magazine. In a couple of weeks I'll hopefully be able to show you how my vision plans out! I also gathered some of my dream desk supplies (some of which I already own!). 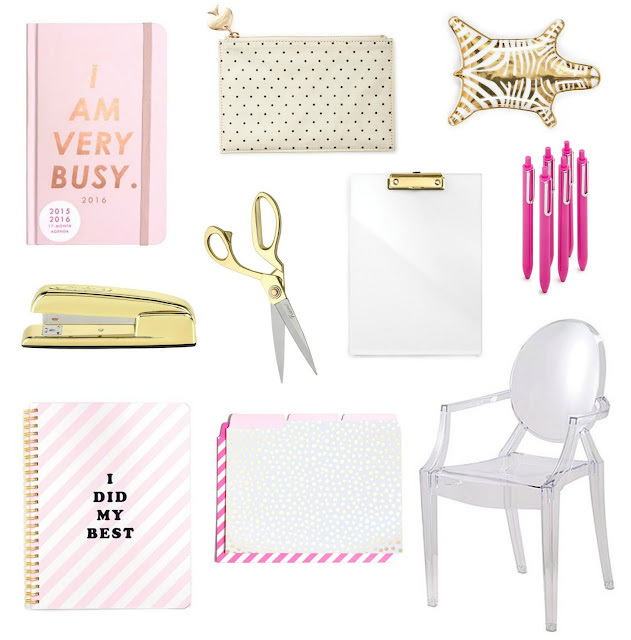 Can you tell that I like gold and pink a lot? 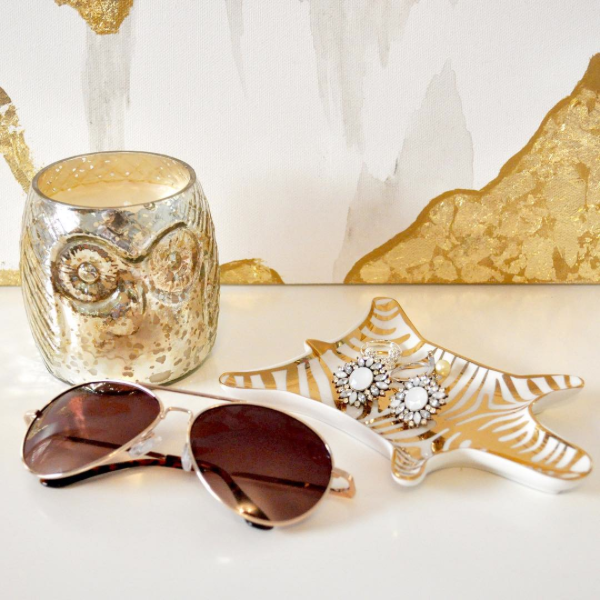 This post is part of the Bloggers Back To School Linkup hosted by Cathleen and Nicole! 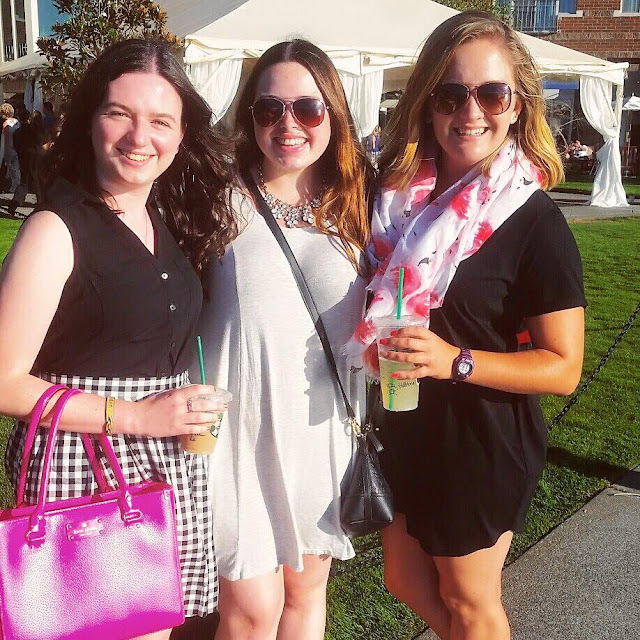 Be sure to check out their blogs for some more #BloggersBTS posts! Whether you're an incoming freshman or a seasoned college student, the first week back on campus can seem a bit overwhelming, but it's also a great time to get back into your routine, or start a new one! I started doing these things last year when I returned to school, and it made coming back to school less of a chore and more exciting. Some of these suggestions are for freshman and some are for returning students, but most can be applied to both of you! It's almost a tradition for me to try a new restaurant during the first week at school. As a freshman, everything was different except for chains, so it wasn't all that hard. It's also pretty easy to go out to a new place when your family is around, because they'll most likely have a car to drive you around town! My family and I always end up going to a new restaurant while they're in town, and it's fun for all of us to go out searching and enjoy a good meal together! If you're coming back, go to a local favorite that you can't get at home! I know at Chapman I've been craving a quesadilla from Albertaco's!! You may be thinking, I'm a freshman and know no one at this school, how do I hang out with friends when they're all the way across the country? Well, here's the thing, you can (and will) make friends the first week of school. The first week of college, including orientation week, is a great time to make some friends, even if these may not be your new best friends. Invite that girl in your class to have some coffee or invite them to go with you to one of your school's orientation events. If you already have your group of friends at school (or they're lucky enough to be your roommates like me!) do whatever you're group does best! My friends and I are a little obsessed with Home Goods and Michaels, so we'll probably be taking a few trips there the first week just for fun. 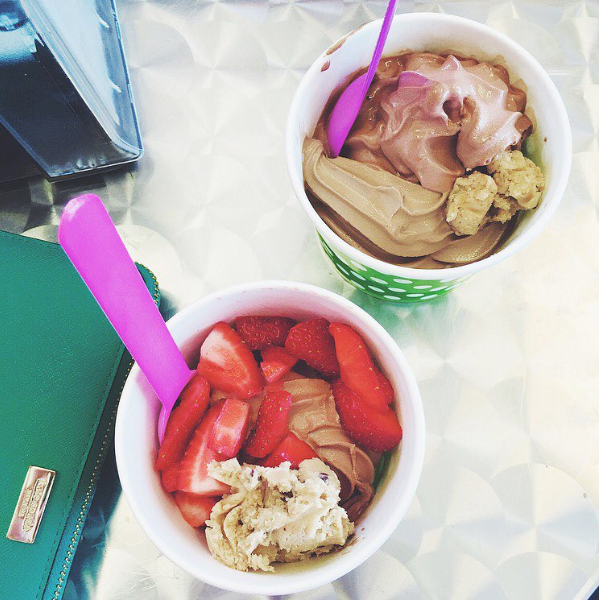 Any plans are good plans when it comes to friends! My roommates and I have done this every single year. It makes coordinating things so much easier, and you'll hear the question "When do you get out of class today?" so much less. Trust me, it'll get annoying after a while of either constantly asking or being asked that question. Write or print out your schedule, tape it to your dorm door, and you're all set! I'm lucky and unlucky that my campus has a very limited amount of food options. Lucky in that it's very easy to see who's working every day and befriend them, but unlucky because obviously eating from the same three restaurants can get boring really fast. However, the college gods seemed to have answer my prayers because the majority of Chapman's restaurants were replaced this year! That means new food to test out and even a new Starbucks on campus! I honestly feel like a freshman again when it comes to dining on campus. Another tip for eating on campus, if the same staff works multiple days a week, be nice to them and ask them about themselves (when they have the time, not when the line is 50 people long). They'll be more likely to make your food right, and if you order the same thing every time (me!) they'll see you and ask if you want your usual straight away to make it easier for you. Some events are limited to freshman, but others are open to all students! Things may sound lame, but it's a chance to meet some new people, win some prizes, and have a good time. 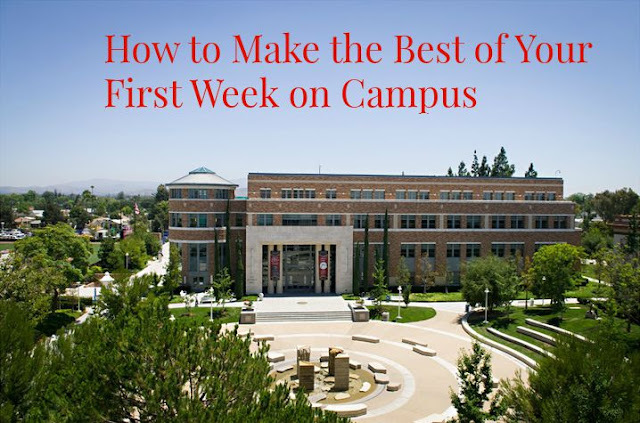 There will be plenty of nights where you can just sit in your dorm room doing whatever you please, but it's best to be a little outgoing during the first week. Getting out of your comfort zone is what college is about, and trust me, it's how you make some of your best friends. Be open to tons of new things, college is an exciting time, and you only get to experience it once! The first week of school is where you can stress about the next few weeks in your new environment, or you can relax a little bit, spend some time with new people and enjoy everything around you! If there's one thing that I have a little obsession with, it's bras. It's a running joke with my friends that I could wear a different bra every day of the month with how many I have. I haven't mentioned it on the blog before though, because I never really had a reason to. In the course of my online bra shopping though, I came across a great lingerie site called Adore Me. So when they asked me to come up with a few looks to go along with some of their sets for their Lashes & Lingerie challenge, of course I said yes! I'm all about making yourself feel beautiful, and I believe a good bra and underwear set can do that, even if they're under your clothes. Aren't these adorable? I really love bras that are a little more brightly colored, even though they may not be the most practical. i.e. Don't wear light colored shirts with these! When I wear bright bras, for some reason I always love to wear bright colors elsewhere in my outfit as well, and I normally go for it in the accessories! 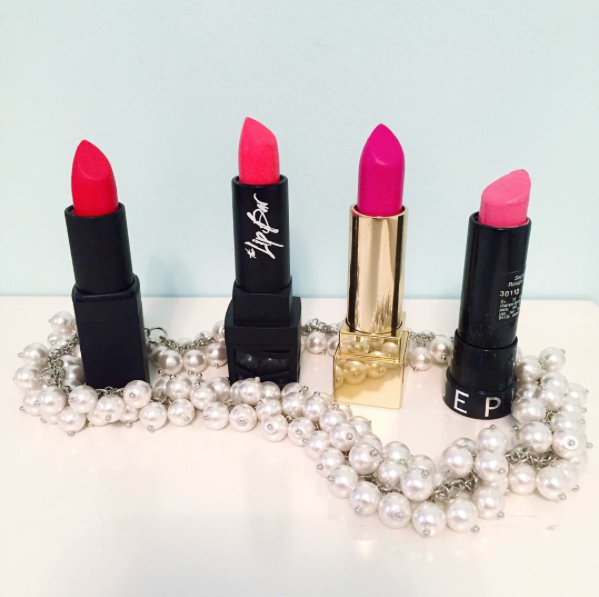 This lipstick from YSL is my go-to when I want my makeup to pop, it's so creamy and stays on for hours! A classic striped dress with pearls is simple, and really makes the colors more intense. I like wearing patterns with my bright bras as they do a great job at hiding the color! I'm obsessed with this unlined lace bra! It's something that I would definitely wear to the beach, a concert, or honestly just around my house (unlined bras are basically the most comfortable things on the planet fyi). 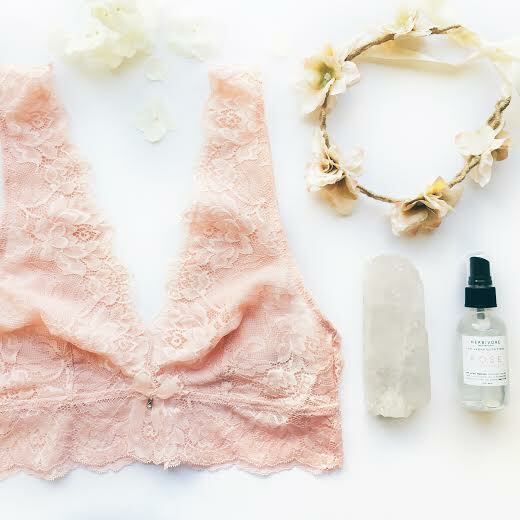 With the blush lace, it's definitely one of those bras that I wouldn't mind peaking out through my dress. Here's how I would style this beauty! The second I saw this bra I thought of the Miss Dior Cherie perfume and a flowy white dress. Miss Dior is such a sweet and girly scent and mixed with this soft look and minimal makeup, I think it makes the perfect combination for the blush lace bra. What's more classic than a black and lace combo? I love the racerback on this bra, and think it would go really well with a whole slew of outfits, but what popped in my head first was red lipstick and an all black ensemble. For this last look I wanted to go a bit darker, and thought of a classic going out with the girls night. 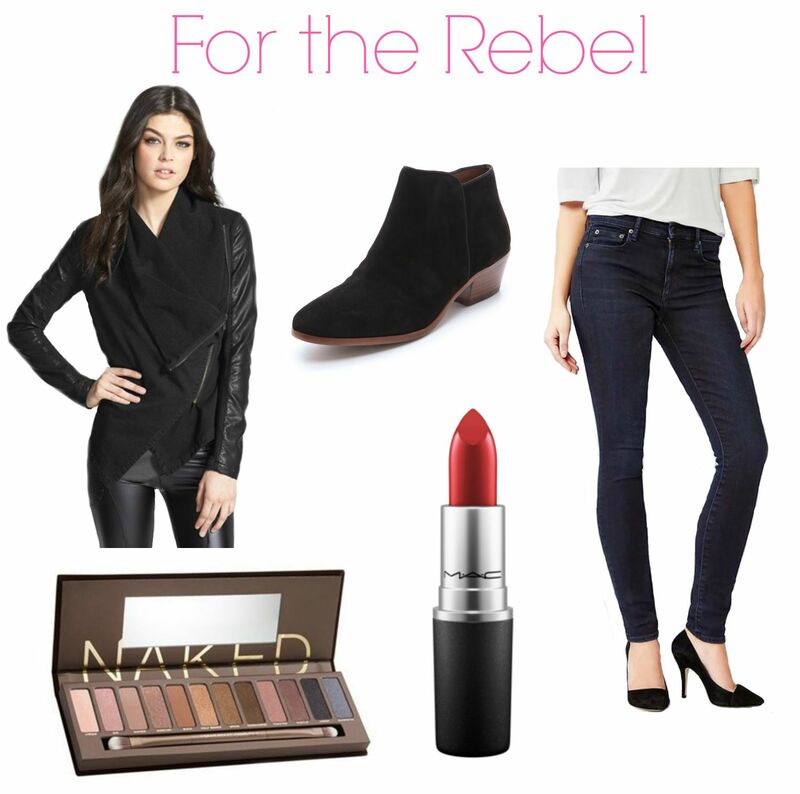 Jeans, a v-neck, and a moto jacket are the perfect thing to compliment this sexier option. A good pair of jeans can really make or break an outfit, and these jeans are my absolute favorite! A red lip spices up the whole look, and is a no-brainer whenever I go out. Although I've never physically tried on any of Adore Me's products I think their whole look book is spectacular and so pretty, very much like the bras I usually purchase. Be sure to check their website out for yourself, and let me know your favorites! This weekend I visited my roommate Jacqueline in Seattle! I've been wanting to visit her for the past few years now, and I'm so happy I finally got the time to go see her and the city. Another goal I get to cross off of my 101 in 1001 list! I went with one of my other roommates Stephanie, and we had the best time exploring the city and seeing everything that we've heard Jacqueline talk about for the last two years! 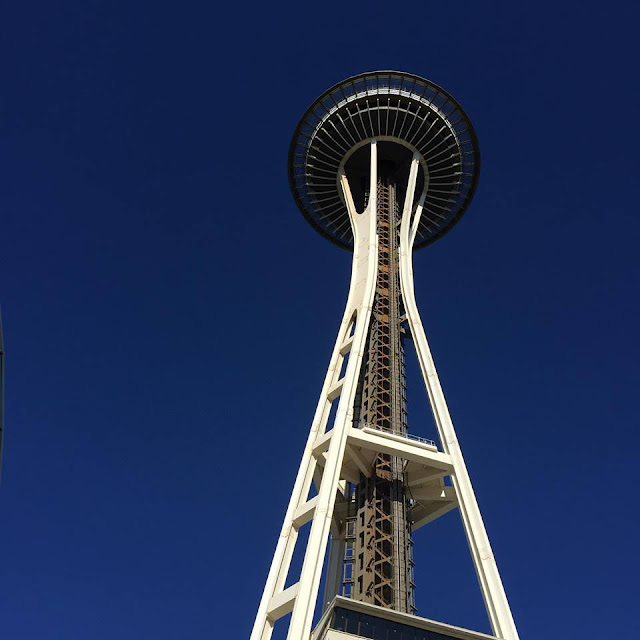 We drove straight to the Space Needle from the airport. We had a reservation at the spinning restaurant at the top, and the food was glorious! It was a three course brunch, and we ended up staying way too long chatting about what we have all been up to this summer. I was so in love with the view. 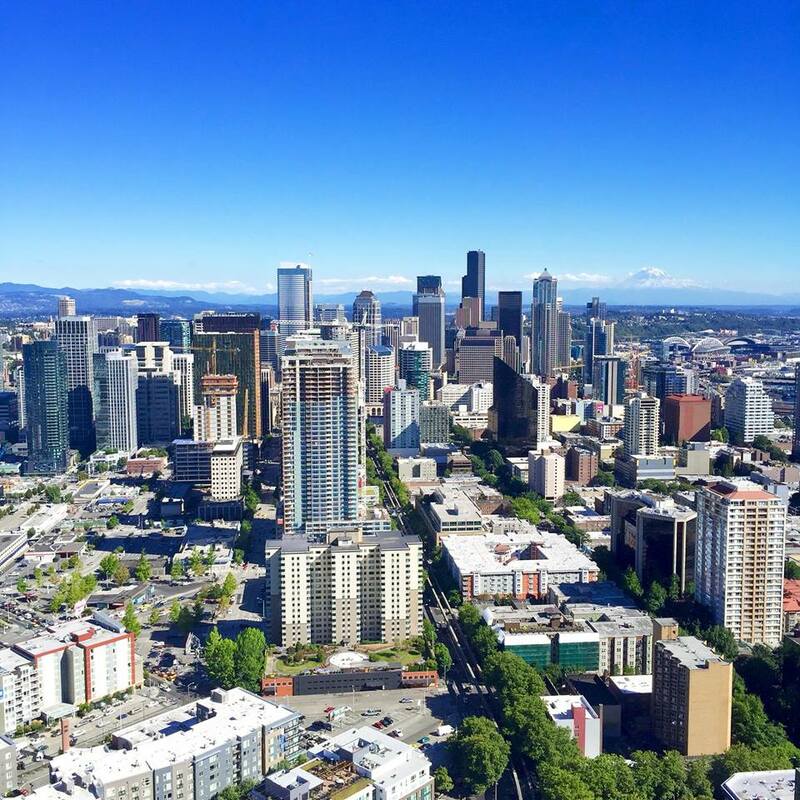 I was snapping pictures left and right and got this amazing one of the skyline plus Mt.Rainier in the background! It's funny how similar Seattle was to San Francisco, at least in some parts, and I felt so at home in the city. 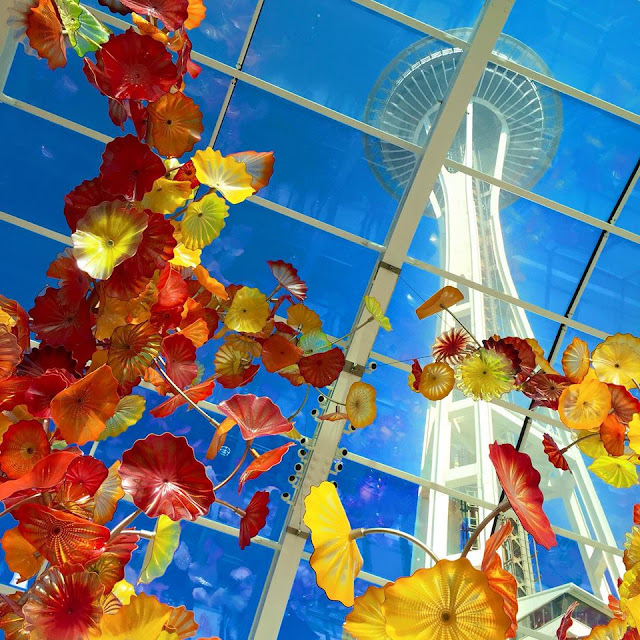 Right next to the Space Needle is the Chihuly Museum of blown glass. All the art is amazing, but my favorite was this flower sculpture out in the greenhouse-like area. Isn't this such a cool view of the Space Needle? We also traveled to a place called Carillon Point out near Jacqueline's house, and it was so beautiful out by the water. It was around sunset and there was a wedding happening at the hotel nearby which made the visit even better. There were so many sailboats and people walking along the dock, it was probably one of my favorite places that we went to during the trip. 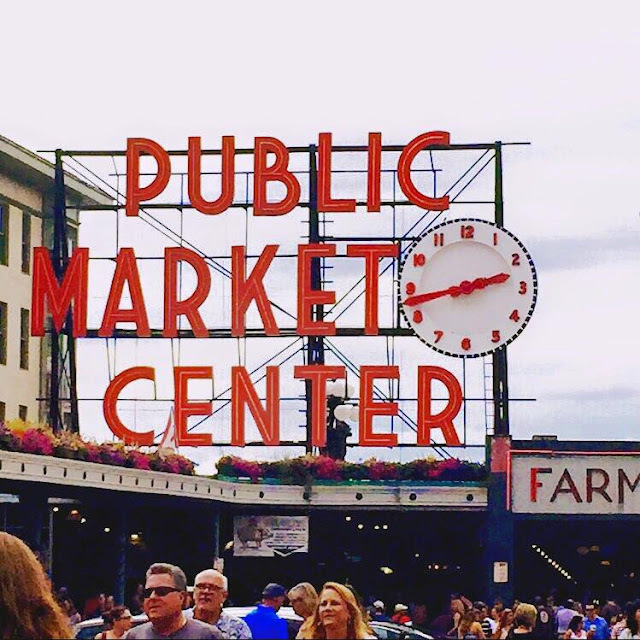 Of course we went to Pike's Place Market as well! 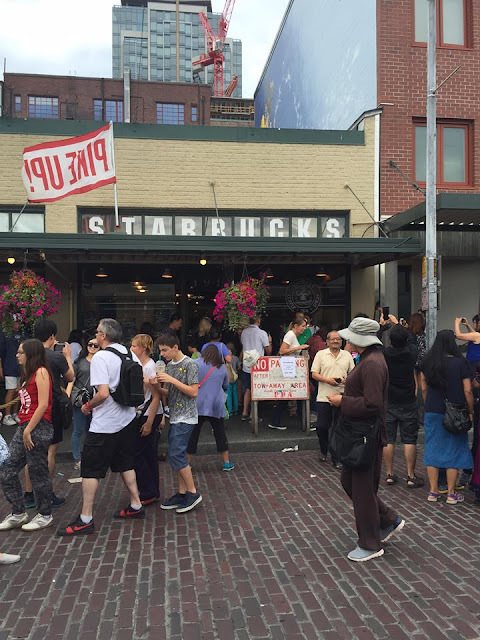 We saw the first Starbucks ever, however we didn't get anything from there because the line was ridiculously long. I can get my cool lime refreshers at any other of the million Starbucks in the area, so we just went to another one later on. 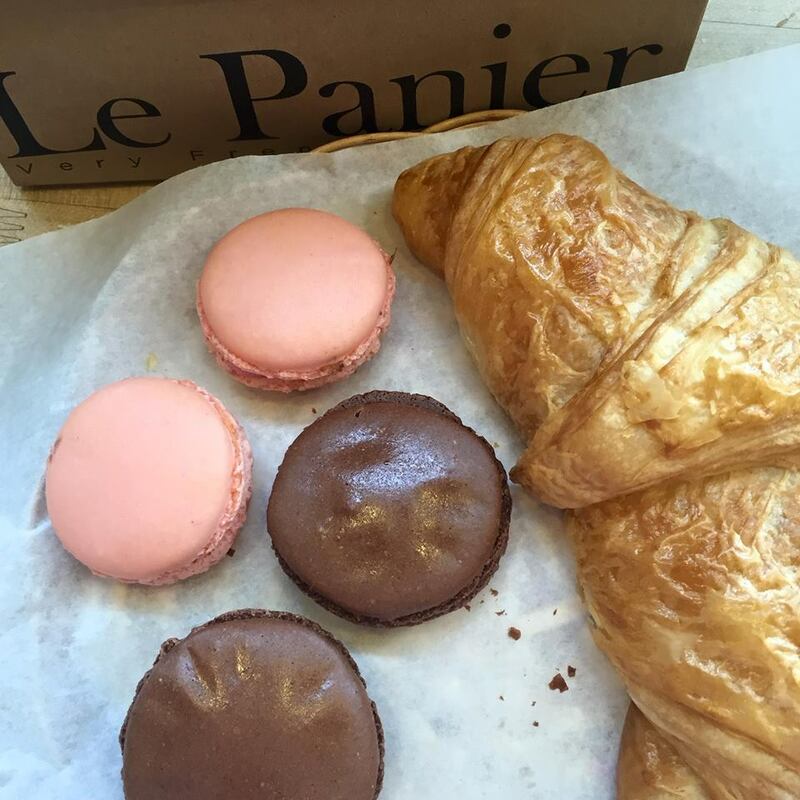 We did grab a snack at Le Panier though! Honestly, I'm not a huge fan of macarons, but I heard they were famous here and got some anyway. They were the best macarons I've ever tasted! So soft, yet firm at the same time, and the flavor was spot on! I got raspberry and chocolate, and I also got a butter croissant because I had already eaten like half the sample of the one they had out, so I figured I should at least pay for a whole one. The market place was extremely busy that day (I guess we should have anticipated that since it was a Saturday in the middle of the summer...) but it was still cool to see al the things that the art vendors were selling! We also went to see Taylor Swift while we were there! Let me tell you, she is quite the theatrical performer! It was such an amazing, high-energy show and I'm so glad we were able to find tickets the day before the concert. She ended up remixing some of her songs (I knew you were trouble was slowed down and sounded AMAZING. I swear I need to find it on the internet somewhere) and brought out Fetty Wap, Ciara, and Russell Wilson the quarterback for the Seattle Seahawks! I can absolutely say that I'm an even bigger fan of hers after going, and was a little upset that I didn't get any good pictures from the show. 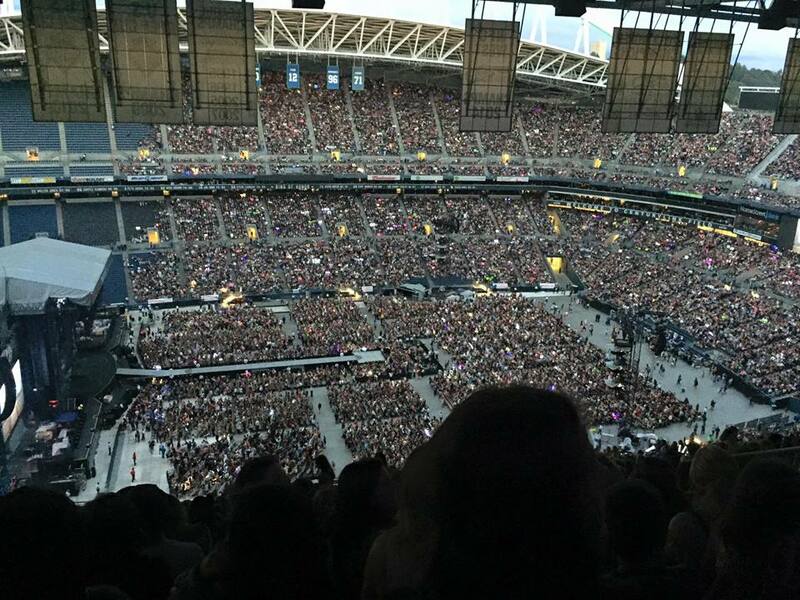 We were up pretty high, and every time I tried to take a picture of the monitors it would just reflect light into my camera. Oh well. I cannot wait to go back to Seattle, whenever that may be! Thanks Jacqueline for letting us come visit you! Recruitment can be a terrifying experience if you have no idea what to expect. It's a stressful, long process that can tear you down if you aren't prepared for it. However hard it may seem though, it's supposed to be fun and enjoyable at the same time! Here are a few do's and don'ts to make things a little easier for you. Don't pretend to be the person you think a particular sorority wants. It's easy to get caught up in what you believe a chapter is looking for, but it's also easy for the chapter to see that a girl isn't being honest about who she really is. By being yourself and trying to connect with each woman you talk to on a personal level, you can better understand which chapter best fits who you are. 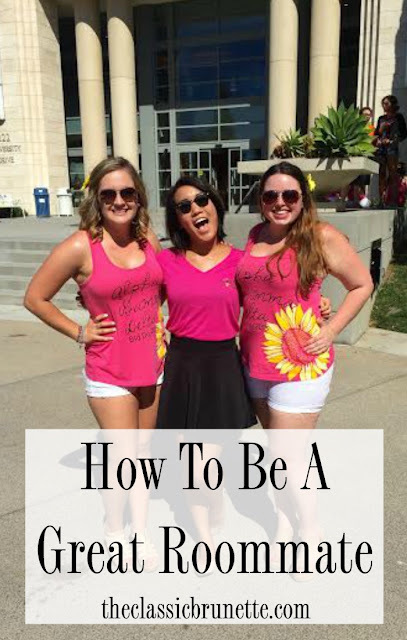 If you are disingenuous with who you are, you could end up in a sorority that doesn't fit and feeling like you don't belong. When I went through recruitment last year I went in thinking I wanted one particular sorority, and no other one would do. Turns out, that sorority declined me after the first day. Did I get upset? Of course I did! But looking back it was such a stupid thing to be upset about when I fit so perfectly within my own chapter. You will hear the phrase "trust the system" multiple times during recruitment, and every time you will brush it off like it means nothing, but I promise you, things will turn out right in the end. I got the worst blisters of my life during recruitment! I made the horrible decision to break in new flats only a few days before the first day of rush, and my toes and heels were red and painful for what seemed like forever. So I guess there's a do and a don't with this tip. Do bring bandaids in case of blisters (for yourself and for the other girls who don't bring them) and don't break your shoes in too close to recruitment! You may think that joining greek life will be exactly like the movies depict it, and I can tell you that you're wrong. 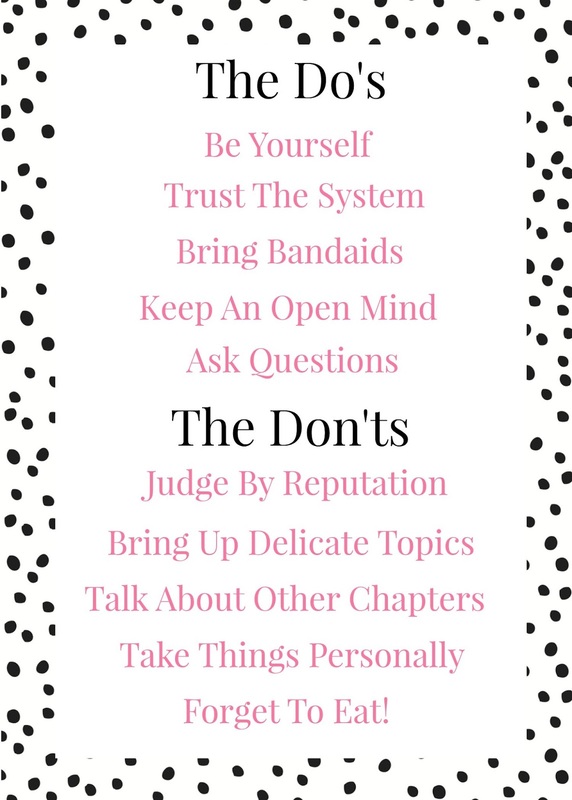 You should try to keep an open mind about everything you've heard about joining a sorority, however you should also understand that not everything you've heard is true. Don't be afraid to ask some questions about the chapter and greek life in general! The women are there if you have any concerns or curiosities, so make sure to let them know if you have any. Here are some example questions you could ask to find out a little more about the chapter: What is your philanthropy and how does the chapter get involved? Why did you join this chapter? How have your sisters effected your life in and out of school? If you aren't a freshman, or even if you are, you most likely have heard some rumors about each chapter on your campus. As a sophomore with friends in some of the houses, I was definitely aware of the reputations some of the sororities had on campus. However, when I went into each chapter's room, I left those reputations at the door. Each chapter is different from the reputation that gets spread around campus, so don't go in thinking "oh these are the party girls" or "these girls only care about looks." It's impossible to judge a whole group of women from only knowing what other people say about them or from interacting with one or two girls. These include boys, politics, partying, money, drinking, etc. Use good judgment when speaking to people in the chapter! A good rule of thumb is to avoid anything that would make you uncomfortable if a stranger brought it up to you in conversation. Each chapter is interested in you, and it is a little disheartening when all someone talks about is their love for another sorority. It's great if you're a legacy somewhere else, but even if you know for sure where you want to be (although remember, keep an open mind!) girls are taking their time to speak with you. Give each group a chance, and you may surprise yourself. This also goes for speaking badly about other chapters. No one likes a gossip during recruitment, and it reflects poorly on you rather than the chapter you're speaking about. You will probably be declined by a chapter you thought you were perfect for. It's a tough thing to go through when you could see how happy you would be in that chapter, but again, you have to trust that the system is on your side. Just because some chapters said they didn't want you is not any reflect on who you are, so it's best to just take the decisions as they come and know that they aren't personal attacks. The first day is the longest since you visit all the houses, so make sure to eat well and bring a few snacks with you if you can. Also stay hydrated! No one wants you to pass out or feel light headed during recruitment, so keep yourself healthy and don't forget to eat with all the hustle and bustle going on! If you have any more questions you can email me at theclassicbrunette@gmail.com where I can answer more in depth! This may seem like a bit of a random post, but it's relevant, I swear! I hear more and more people everyday complaining about how chapped their lips are, and as a chapstick addict myself, I've tested a fair amount of the stuff over the years. Some are definitely better than others, and each brand has their own pros and cons. Here are my recommendations! 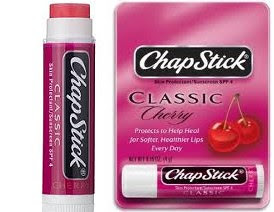 Chapstick was the brand that started it all, for me at least. It's what I reach to when I want something familiar and reliable. It does it's job and comes in a variety of flavors, but overall it has nothing all that special about it. I've said it before in previous posts and I'll say it again, this Bath and Body Works lip balm is the best one on the market. The flavor is as sweet as lemon meringue pie and it lasts forever. Even after the initial waxy feeling goes away the softness stays forever. I always stock up on this when it goes on sale for buy 2 get 1 free! 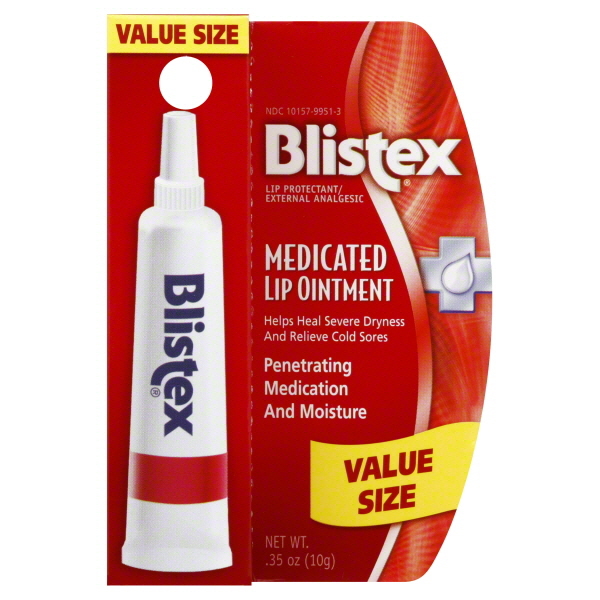 My dad is a huge fan of Blistex, and so am I! In the winter when I travel up to Lake Tahoe and the cold wind gets the best of me, this is what I use. 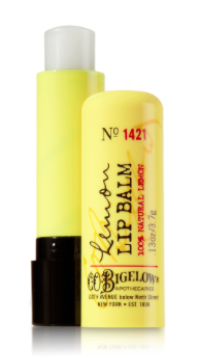 It's more liquid-y than other chapsticks and lip balms and leaves your lips feeling minty fresh! It helps fix chapped skin, peeling lips, and everything in between. Isn't this one hilarious? I got it in my stocking last Christmas and fell in love with it! It's made with beeswax and has become a nightly ritual for me to put it on right before bed. There's a subtle blackberry flavor, but it's winning quality is longevity. I wake up with my lips feeling so smooth and rejuvenated! 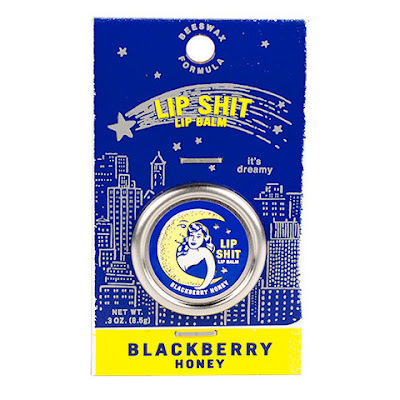 Do you have any favorite lip balms that you would recommend? 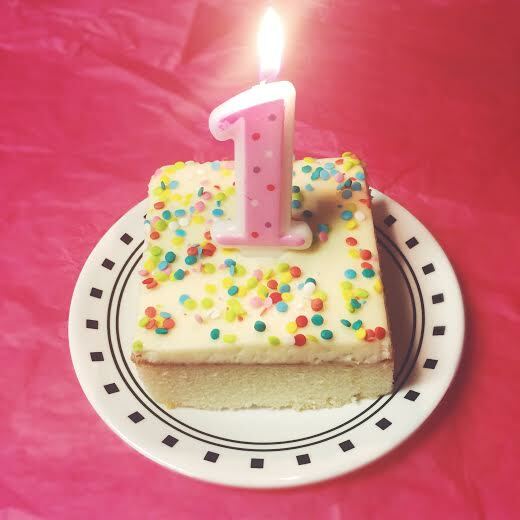 I've been officially blogging on my little corner of the internet for a year now! 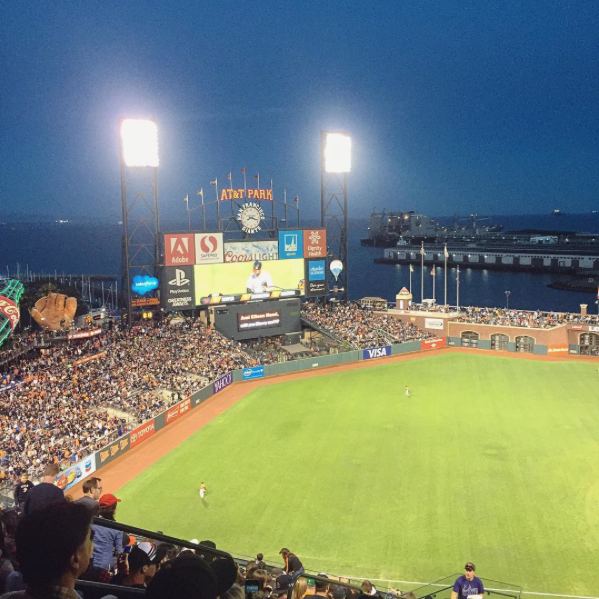 My blogiversary (is that even a real word?) was on Sunday and I totally forgot about it! Well I just had to do something to celebrate it, so what better to celebrate my blog's birthday than getting some cake? Anyway, I wanted to share a few things I learned over this busy year through blogging and give a few tips to those who want to start a blog of their own! One of the most important things that I've learned is that it doesn't matter if 100 people view your post or just your mom views your post, you should be blogging for yourself. Don't try to please other people with your content. As long as it makes you happy keep posting it, there will be someone who enjoys exactly what you do! Another thing about blogging that you don't really understand until you do it is how much hard work it is. When I first started out I thought I could whip out a couple posts in a day like it was nothing. Ha! It's a surprising amount of work that goes into a post, especially if that post includes a graphic! Sometimes writer's block is constant, and nothing seems to be worthy of inspiration. You just gotta keep pushing through and eventually something good will come out of it! All the hard work is totally worth it though. The blogging community is truly a wonderful place to be a part of. I've befriended so many great people through blogging, and hope to continue building on the wonderful relationships I've made! 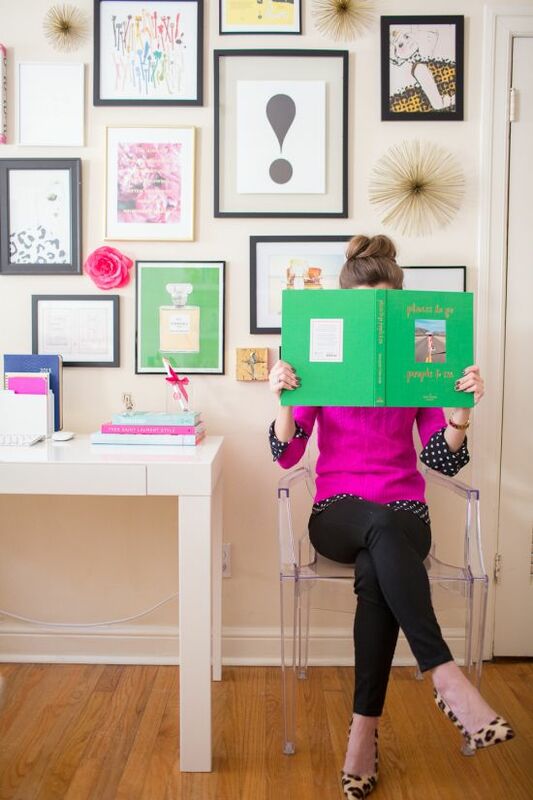 I know a bunch of people who, after looking at my blog, have said "I've always thought about starting a blog!" Go ahead and start one! Getting your foot in the door and taking that leap onto the internet is the first step. If you have something to post on, you're more likely to post. Simple as that! Make sure you pick a blog name that you'll like for a very long time! 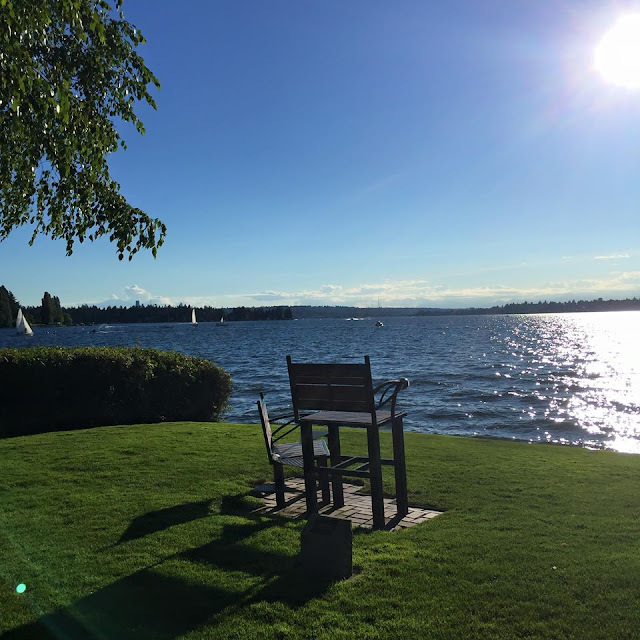 I first started off this blog with the name That Collegiate Girl, but I realized that when I end college that name will no longer be true to who I am and what this blog will be about. I chose the name The Classic Brunette (even though I'm a red head right now, oops!) because it's reflects on who I will always be (you know, after the red grows out). I said this a little earlier in the post, if you post to please others, then you might as well not be posting at all. This is your blog, and you should be interested in everything you write! If you start to find yourself annoyed or bored by the topics all the other bloggers are doing, then start writing about something else. 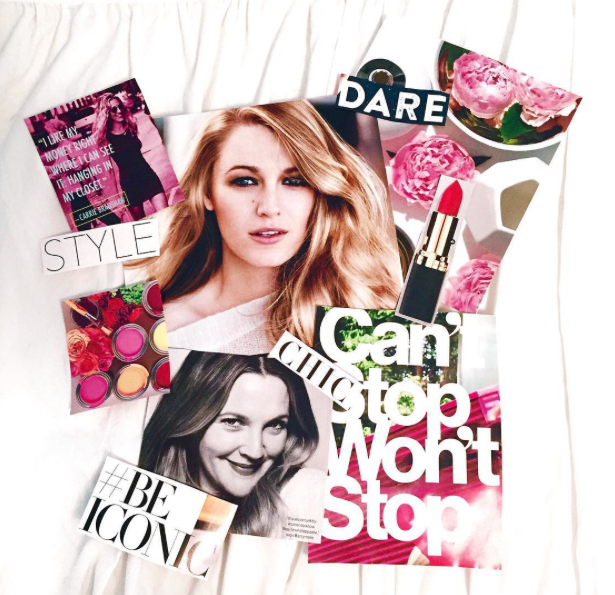 Whether you choose to write about fashion, home decor, music, history, movies, or something completely different, make sure you're passionate about it! Other bloggers, I would love to know some of the things you've learned from joining the blogging the community in the comments! And for all my readers I want to know more about what you would like to see on the blog and if you have any questions about anything. Going into my junior year of college, I've definitely come to realize that there were some things that I either forgot to bring to the dorms, or just didn't think of at all. To help all of my college students out there I've decided to make a list of 10 things that I should have brought (and ended up buying) the last two years! You know all those boxes and tubs that you use to bring all your stuff into the dorms and then toss into the trash once you've set everything up? Yeah, don't toss those. At the end of the year you have to pack everything up again, and those boxes you threw away would be so helpful! I invested in these storage bins (with wheels!) from Target that I always kept under my bed when I was in the dorms! When you aren't using them to move you can use them as storage space for out of season clothes, snacks, cleaning supplies, etc. A water boiler would have been so useful all those nights that I tried to make noodles in my dorm room. I never ended up getting one (because I moved into a dorm apartment with a kitchen sophomore year), but I know many people who did. My friends who were smart enough to have a water boiler could use it for a variety of things, but most people I know used it to make tea when the weather got cold. I have this one at home and it's the easiest thing to use! Dorms don't smell good. I could never pinpoint exactly what they smelled like, but it was probably a mixture of sweat, food, and dust, among other things. Candles are banned on most campuses, but air fresheners and plug-ins aren't! I always have two bottles of Febreeze in my room (So you don't get bored of the one scent) and my roommates and I recently got these plug-ins for our condo. They make the whole place smell amazing! Also if you don't live in the dorms this is one of my favorite candles! If you're in a sorority, you're going to be exposed to a lot of crafting. You craft for your big, your little, and basically anyone who will accept a craft will get one. Even if you aren't in a sorority, there will be times where you will want to decorate your space. A little DIY art makes a room look and feel so much more lived in than blank walls. Paint your name in wooden letters to hang over your bed, or make a cute sign for you and your roommate to hang outside of your door. It's also a great way to pass the time if you're stuck in the dorms for one reason or another. You have all your snacks lined up for your dorm, but sometimes it's easy to forget that some of these things require utensils. Picture me freshman year trying to eat mac and cheese the first week without a fork or spoon....it didn't go too well. Speaking of utensils, if you buy regular reusable ones, you have to wash them! I actually bought a bunch of plastic ones, but if you do opt for the real deal, please get some soap! Since we're on the food topic, I should mention spices. Salt and pepper are basically a given, but sometimes you just want some flavor. I recommend cinnamon for when you want something sweet (cinnamon toast is basically dorm food heaven) and garlic powder when you want to feel fancy. I had a habit of making lots of garlic bread in the dorms last year, and it was delicious. Adding spice to your microwave meals makes you feel like you aren't stuck eating prison food. Another positive is that most spices are relatively cheap at your local grocery store. I had countless rips and tears happen throughout my two years in the dorms. My buttons would sometimes pop off or I would accidentally stab my comforter with scissors when I was crafting, you name it I probably ripped a hole in it. I can do simple sewing, and a tiny little sewing kit is extremely helpful when you're extremely clumsy with sharp objects. My roommate (bless her soul) is a fantastic sewer compared to me, and I've had her sew more things than I can count using the sewing kit my mom gave me. The dorms can get pretty cold in the fall and winter, and stocking up on blankets is a necessity. TJ Maxx, Home Goods, and Marshalls always seem to have an abundance of cute throws (I've probably bought way too many from those stores) but you can also attempt to make one yourself! My best friend made a t-shirt quilt out of all her old t-shirts and it looks fantastic. I'm going to have her help me make one for me and my old shirts that have been sitting in my closet for ages. Either way, blankets are a great thing to have in your room! Last, but not least, is an extra pair of sheets. (I promise I didn't try to rhyme, it just happened) Heading into the dorms I for some reason thought it would be okay to only have one pair of sheets...it wasn't. When you go to wash your first set of sheets, you should have a backup to put on in the meantime! It keeps your sheets from getting dingy and gross, and it gives you more versatility in your decor. I love these flamingo ones from Macys! 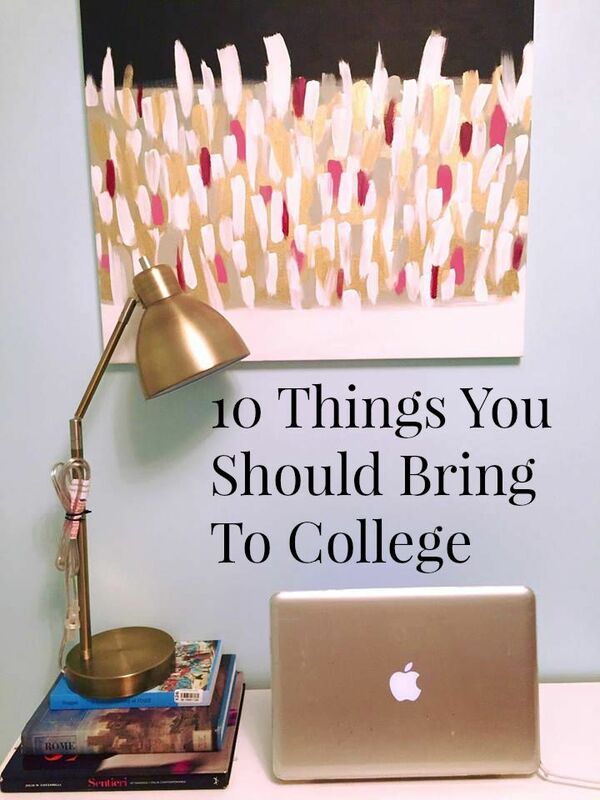 Be sure to check out my previous post about 10 Things You Should Bring To College and How To Be A Great Roommate! Also if you have something to add to this list I would love to hear about it in the comments! I also love seeing everyone's dorm room, so tag me on Instagram @samimast and I'll check it out!